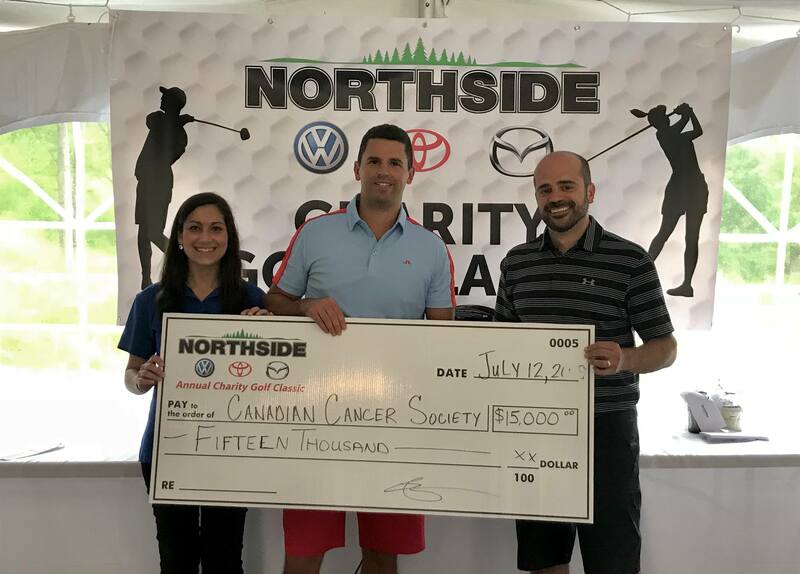 On Thursday, July 12th, the Northside Auto Group hosted the 5th Charity Golf Classic at Crimson Ridge Golf Course in support of the Canadian Cancer Society. It was a day filled with a little rain and A LOT of fun. The event was completely sold out weeks before the registration deadline. We want to thank all the incredible sponsors for their generosity. A special acknowledgement going out to our Gold Sponsors (RBC/RBC Wealth Management & Jobst Construction) and our Silver Sponsors Maslack Supply Limited and Mazda Canada as well as our numerous Bronze Level/Hole Sponsors and those who donated prizing and donations. A big thank you to all the golfers who participated and helped us raise $15,000 for the Canadian Cancer Society. Monies raised from this event will be kept local for the Wheels of Hope program in Sault Ste. Marie which assists local cancer patients with their transportation needs to and from treatment. The success of this tournament would not be possible with out the help from our organizing committee, sponsors, volunteers, venue staff and of course participating golfers. We look forward to seeing you again at the 6th Charity Golf Classic in 2020.